You both lead busy lives, full of responsibility and distraction. Take some time to enjoy each other and remember what it is you’re working so hard for. Now’s the time to make some awesome memories with your favorite person on the perfect couples weekend! You and your SO have been through some adventures, but here’s one that is sure to bind you forever. Take the plunge . . . the plunge into William’s Canyon on this fun little ride called the TERROR-dactyl. Reaching 100 miles-an-hour and dropping 150 feet, this is an adventure you’ll still be talking about in your gray days! Local’s Tip: Be sure to leave a memento on the Old Maid’s Kitchen during the Cave tour to seal your love forever! You started your day on top of world, now experience the true depth of beauty in Colorado. 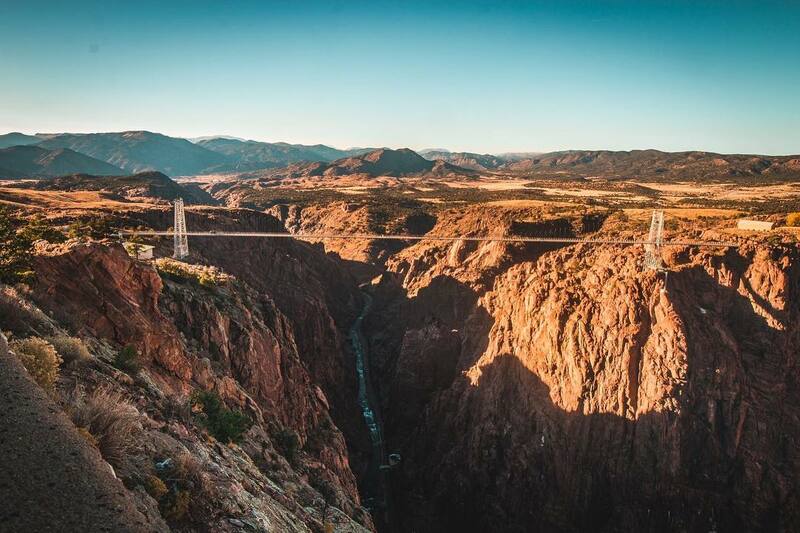 The Arkansas river cuts it’s way through miles of the Colorado countryside and the Royal Gorge Bridge allows you to stand right on top and soak it all in. If you were looking to ask your love an extra important question, the bridge would be an amazing place to do it. Local’s Tip: Grab a selfie next to your home-state’s flag as you cross the bridge. You’ve had a huge day and you’ve earned some quiet time. Check into the Royal Gorge Cabins, just down the road from the bridge. The view is just as epic and there’ll be no banging of doors or rustling of ice machines to disturb your evening in front of the fireplace. Local’s Tip: Call ahead for reservations. These cabins go quickly! Time allowance: All night long! 8 Mile Bar and Grill is right across the street and is owned and operated by the same folks who built these awesome “cabins”. Enjoy great fresh selections with Colorado craft beer, and be sure to secure your spot by the fire pit before the stars come out!